The must-have platform game that has been missing from every iPhone! Enter an amazing adventure as you try to escape from Sugar Island, a legendary realm ruled by cunning animals. Try to avoid being captured as you face cute but vicious monkeys, oddly agile hedgehogs, juggling tigers, live cannons, creepy crows, ravenous fish, sporty beavers and many other enemies. Explore new worlds by teleporting through magic hats and commandeering different vehicles, from magic balls to hang gliders. 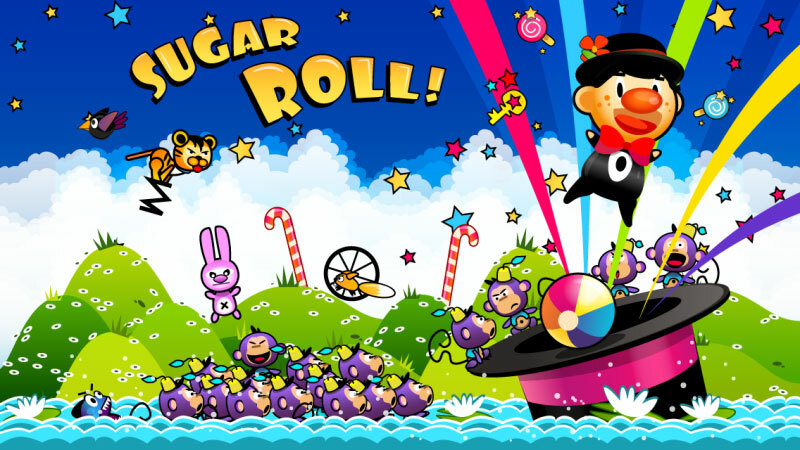 Evolve while making your way through more than 45 levels and gather magic lollipops that give you supernatural powers. Three different styles of gameplay are available, creating the ultimate platformer. A casual game that combines both platform and puzzle elements. Explore different areas, wisely choose your magic lollipops to find escape routes or magic stars and use your skills to avoid crazy situations. Sugar Roll Intro Video is out!